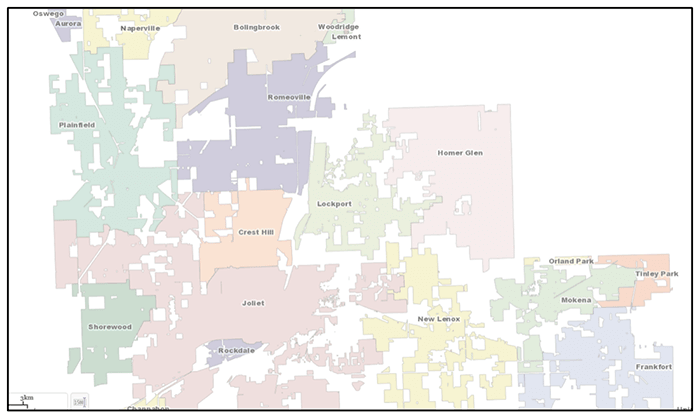 A municipal government, such as a village or city, generally has broad jurisdiction over all the territory within its “corporate boundaries.” The phrase, “corporate boundaries,” refers to outermost property lines of any parcels that have been “annexed” to the municipality. Thus, a municipality can “grow” over time by annexing new property and thus expanding its corporate boundaries. Will County GIS Data Viewer, http://apps.willcogis.org/Html5Viewer/?viewer=Will_County_ Base_Map (last visited May 3, 2018). Id. (annotations provided for clarity). 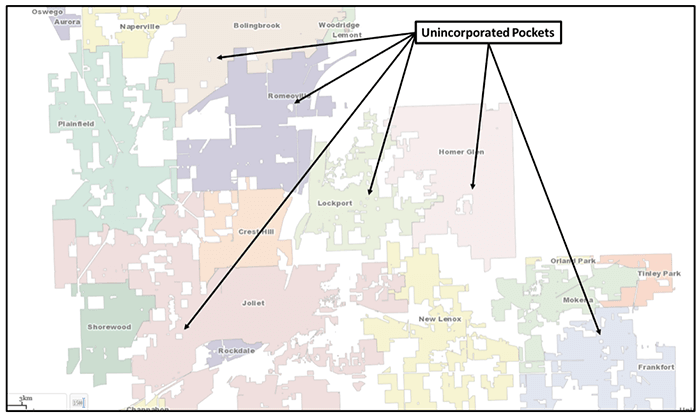 Although the existence of these unincorporated pockets is not generally a problem, it can become a problem when the unincorporated area is very small. The reason for this is that a small unincorporated area within a municipality’s boundaries will naturally receive the full benefits of all the services the municipality provides (including but not limited to police and fire protection) without paying taxes to support those services. In situations like this, the Illinois Legislature has seen fit to provide a mechanism by which municipalities can correct this patent injustice. Pursuant to Section 7-1-13 of the Municipal Code (65 ILCS 5/7-1-13), municipalities are authorized to forcibly annex unincorporated areas that are (1) less than sixty acres in size and (2) wholly bounded by one or more municipalities (as well as a number of other circumstances). This annexation power is a great boon to more-developed municipalities that are looking to fill in their maps, but because it is in derogation of the normal rule that annexations are to be voluntary (because the owner(s) of the annexed property are agreeing to pay taxes in exchange for municipal services) it comes with strict notice requirements that must be followed if the annexation is to be upheld. The corporate authorities of each affected county. Failure to properly provide any of the foregoing notices within the timeframe set out in the Municipal Code will be fatal to the annexation attempt. In addition to the mandatory notices, a municipality contemplating the forcible annexation of a wholly-bounded territory needs to consider whether it is also required to provide notice to the corporate authorities of the township in which the territory lies and, in particular, the township’s highway commissioner. While failure to give notice to these groups may not be fatal to the annexation, it may expose the municipality to a claim for damages by the township. Assuming that a municipality gives proper notice of its intent to annex and actually passes an ordinance annexing the wholly-bounded territory, the work is still not done. In order for the annexation to take effect, a certified copy of the ordinance—with an accurate map of the annexed territory attached—must be filed with (1) the County Clerk, (2) the County Recorder, (3) the local election authorities, and (4) any post office that serves the annexation territory. While a municipality has clear statutory authority allowing it to fill in wholly-bounded unincorporated areas within its corporate boundaries, any attempt to exercise this authority must be carefully considered and even more carefully executed. The difficulties are manifest: providing proper notice may require the municipality to track down the home addresses of both taxpayers and library and fire district trustees; the facts (1) that some but not all of the required notices are conditional and (2) that a failure to give some but not all of the required notices may invalidate the annexation attempt means that a municipality needs to make sure that it does its investigatory work well in advance of actually attempting a forcible annexation; and the fact that the annexation is, at least nominally, “forcible” can lead to other, internal disagreements regarding the annexation ordinance’s propriety. At the same time, allowing a small property to continue to reap the benefits of municipal services without contributing anything to support them is clearly unjust. If your municipality wants to close the gaps within its own borders without running afoul of the many pitfalls associated with wholly-bounded annexations, contact the law offices of Spesia & Taylor today and one of our experience municipal attorneys will assist you.